If you're in business, you're going to need business cards. Xpress Printing offers plenty of options to make your cards unique so you can set yourself apart from your competition. Call us to talk about the the different types of card stock that we can use to print your cards, as well as custom sizes, shapes and specialties. Business cards are usually 2.5" x 3", but we can print custom sizes if desired. We can also cut your cards to custom shapes - one popular option is rounded corners. Want your company logo to shine? That's where foil stamping comes in. We often recommend this process for business cards, because it allows certain graphics to have a metallic texture. Have your logo foil stamped on your cards so that your new customers will be blinded by your brilliance. 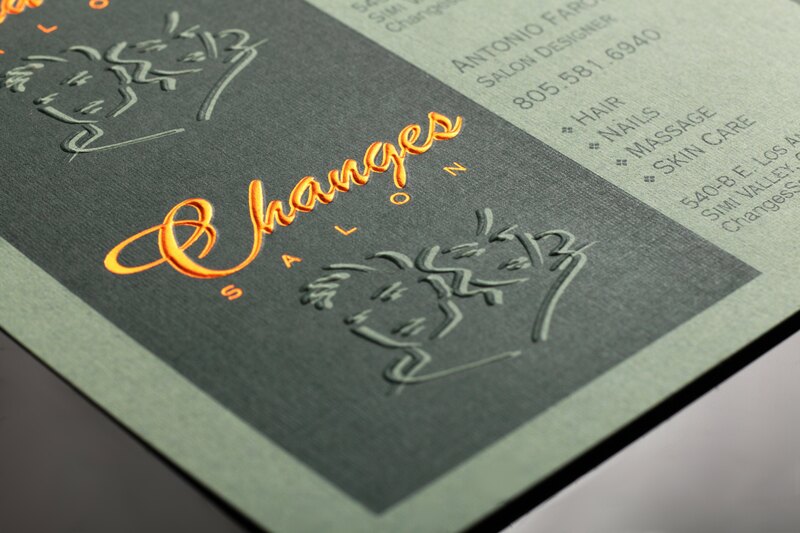 Embossing is another way to make your logo literally stand out on your business cards. It creates a raised surface where your logo is printed, giving the card a 3D effect.